Being a daughter of the land of the long weekend, a day’s not worth celebrating unless it’s a day off, and I can’t see that happening in a hurry. But this yearning for a Big Day is not just a rush of blood to the collective heads of the City of Melbourne Public Relations Committee. Tom Griffiths in Hunters and Collectors goes through some of the other attempts to have a Melbourne Big Day- attempts that were as unsuccessful as I strongly suspect Melbourne Day will be. Separation Day on 1 July, to celebrate the separation of Victoria from New South Wales in 1851 was Victoria’s first day of commemoration, but it faded away quickly. It was inaugurated only a couple of days before the discovery of gold. With the influx of newcomers with the gold rush, it meant little and soon fizzled out. 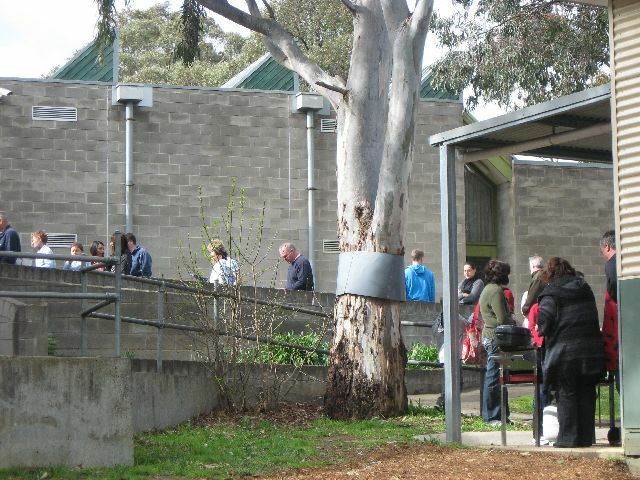 The recent ringbarking of the Separation Tree in the Botanic Gardens provoked regret but not outrage, and I suspect that Separation’s not about to capture the public imagination anymore. In 1911 the Victorian Education Department declared 19th April to be “Discovery Day” because on that day Lieutenant Hicks sighted Victoria from Cook’s Endeavour (and sailed right on past….). But then Anzac Day was inconsiderate enough to happen on 25 April so that was the end of a perfectly good date because the children and their teachers had quite enough to do with Simpson and Last Posts etc. What about November 19 then? It became “Pioneers Day” to commemorate the day that Edward Henty landed at Portland and became, so it was said, Victoria’s first permanent settler, complete with ploughs and sheep. I don’t know when this day fell off the calendar. We tend to have days for good causes, but particularly around the turn of the twentieth century, “nature” days were all the go. There was Arbor Day, (picked up from the United States) now known as National Tree Day, and held at different times around Australia. I remember this one- being given a little tree in a tube to plant in the rock-hard, clayey school garden. I also remember planting trees down by the Yarra River- the plantations are still there- but I’m not sure if that was for Arbor Day or not. It may have just been a tree-planting scheme. Then there was Bird Day, which was first held in Victoria in 1909 by the Gould League. It was their centenary in 2009- look here at their gallery of memorabilia. I was a proud member of the Gould League with their tasteful little badge (I wonder if I still have it somewhere? ); I loved the smell of their glossy magazines, and I had their sketch book with the magpie on the front. I entered a picture of an ibis (execrable creatures) for one of their competitions. To be honest, there’s a twitcher in me that threatens to escape sometimes. Wattle Day? 1st September apparently. It’s their centenary this year. They’ve got some fun suggestions for celebrating it. Or not. I remember someone bringing wattle to my fourth grade teacher -do children still take flowers to class? I suspect not. Poor old Mrs Kenny was allergic to it, and was away from school for a fortnight. Would bursting into “bwah-ha-ha” lower the tone of my blog? Why not? I’m feeling so festive on our putative 175th Anniversary… Happy Melbourne Day to you too. This book is part of a projected trilogy and it was shortlisted for the Booker Prize in 2008. It did not win, and perhaps it’s a work best appreciated once the other volumes appear. There are hints throughout the book that there is an endpoint in sight for the author, even if we don’t as yet know how we’re going to get there. The author foreshadows that people and events will one day be represented in a shrine, but we don’t know where this shrine will be, or when it will be created. The story line unspools slowly, almost as if the plot itself is caught in a sticky opium haze. Within the 468 pages we have the arrival of a boat, its provisioning and slow movement down the river towards the open sea, then its journey to Mauritius, and the story closes before landfall is made. 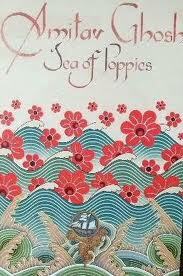 The impetus of the book is the gathering together of the cast of main characters- a widow who escapes suttee, a bankrupt rajah, a mulatto American sailor, a French woman under the care of a wealthy English opium-trader- and the chain of circumstance that brings them to this boat. It was in this slow accumulation of characters that I was most aware of the trilogy-nature of the book- not unlike Lord of the Rings perhaps, although I hope that the book doesn’t take as long to divest itself of all these characters as that particular trilogy did! In less assured and more impatient hands, this would have been rushed but in this book I found myself introduced to each character and drawn into his or her story before moving onto the next one. Each character was clearly established in my mind, so that it was a case of merely picking up interest when I met them again, rather than having to flip back to see “Now, who’s this again?”. There is no cast of characters, and to Ghosh’s credit, I didn’t feel that I needed one. Beyond the literary level, the book is an explication of British colonialism and the networks between different ports of Empire across the globe. Set specifically in time- March 1838- the book captures well the interconnectedness of British colonialism. The Indians provide the opium that is forced onto the Chinese in order to prevent a currency imbalance in return for Chinese goods. Slave ships are reconfigured to ship indentured Indian labour to Mauritius to exploit the sugar industry which in turn is fed into the colonial economy. We have characters who straddle cultures: the French Paulette drawn into the British colonial family despite her upbringing by an Indian foster-mother, and Zachary Reid, the son of an American slave mother and white father. The language of the novel draws on a pidgin-English, a “jolly hockey-sticks” bombast amongst the English characters and Indian vernacular. Ghosh makes no concessions here. The dialects are part of the text, with no glossary, no semantic crutches, and as a reader you just have to deal with them and move on (dare I say “Move Forward”?). And move on I did, and I look forward to reading the next installment. It seems that much ink has been spilled in Australia trying to define Australianness, and I had always assumed that this was a form of nationalistic adolescence that we would eventually outgrow. Just as it’s hard to imagine your own parents as teenagers, it hadn’t occurred to me that the Mother Country herself might have undergone the same soul-searching. But clearly the debate over Britishness and Englishness is a lively one. I’m aware of, but to my embarrassment have not read Linda Colley’s Britons, even though it sits on the shelf waiting to be read. However this book distances itself from the endeavour of explaining the distinction between Britishness and Englishness, and does not enter into the debate over the process by which the two concepts were developed. 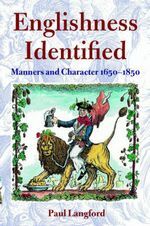 Instead, Langford looks at “the things identified rather than the process of identification” (p. 2) In particular he focuses on manners and character. Langford argues that until about 1650, the English were viewed as Europe’s mavericks- capable occasionally of spasmodic splendour, but also prone to bouts of violence, turbulence and instability. If pressed to nominate the point at which there was acceptance of the possibility of English pre-eminence, it probably came somewhere around the 1760s. From the eighteenth-century on, there was increasing interest in England and its people from Continental travellers and an period of outright Anglo-mania, particularly on the part of the French, between the 1730s and 1780. Langford draws on the travel writings of these visitors as his primary sources, much of which was written with the droll superciliousness not unknown to travel documentaries today. He has divided his book into six main chapters: Energy, Candour, Decency, Taciturnity, Reserve and Eccentricity and these in turn are divided into subsections likewise headed by nouns- barbarity, domesticity, clubbability etc. At times the distinctions are not clear-cut. For example, the coverage of Liberty under “Eccentricity” is not intuitive; or the inclusion of Conversation, Oratory and Clubbability under “Taciturnity” undercuts the chapter heading somewhat. But as he says, “feelings are hard to distinguish from thoughts” (p.251), and hard to distinguish from actions as well. They’re slippery things, feelings, and don’t always fit neatly under a heading. The chapter structure of the book reflects the emphasis on affective concepts, as suggested by the title. There is an underlying chronological thread to the argument as well, though, and it is not served well by the overarching structure. He argues, as did Marjorie Morgan, that the Evangelicalism of the late 18th century gave rise to new ideals of behaviour, and he begins his two-century examination of the change in Englishness from the middle of the 17th century. He notes that there is an evolution over time, but he does not give the chronological factor much prominence. This a-chronological (if there is any such word) approach is underscored by the formatting of his footnoting, where a primary source is dated on its first appearance, but not in subsequent citations. Because there is no bibliography, it is nigh on impossible to locate a reference amongst his detailed footnotes to ascertain whether it is an observation made in the late seventeenth or mid-nineteenth century. The footnoting format could well have been imposed by the publishers- although it would be a pity to learn that a University publisher was stepping back from academic conventions in this way- but it does not serve the book well. Although not engaging at a theoretical level with the Britishness/Englishness identity debate, the foreign travellers that Langford cites can clearly differentiate between the English, Scots, Irish and Welsh in their observations. Because he is drawing on such a large dragnet of observations, there are often inconsistencies between them, especially when closely related traits are discussed in separate sections of the book. However this did not detract from his argument: instead it served to underline that character is just as much in the eye of the beholder as in the image that the subject wants to project, and just how complex, baffling and nuanced a ‘national character’ can be once you try to move beyond the stereotype. This is not a book about events or facts, but instead it is about ideals. Ideals, suggests the author, reveal as much or more about a society as reality does. The ideals she is exploring are those found in three different genres of improving literature published from the late eighteenth century to the mid nineteenth century. The first genre is the courtesy book, a literary type written primarily by and for men. Courtesy books often took the form of an informal, practical guide written by an older man, based on his personal experience, for a younger man. Some focussed on the arts of worldly success, others on civility and deportment, but underlying them all was the assumption that manners and morals were inseparable and indistinguishable. The second genre is the conduct book, which became more popular under the influence of Evangelicalism in the mid-late 18th century. The underlying principle was that religion- not fashion, or custom, nor taste- was the basis of both manners and morals. The writers were middle class and many addressed female audiences. Finally there were etiquette books, which emerged in the 1830s, even though etiquette itself had been around for much longer than that. They did not so much create behavioural rules in the 1830s, as codify those that had been in existence for the previous 50 years. They were practical digests of rules and information to avoid vulgar behaviour, and unlike the Conduct Books, they were largely indifferent to one’s internal nature and character, moral paradigms or the spiritual domain. Instead, the focus was on outward visible indicators and display. She suggests that the etiquette book arose during the 1830s as the upwardly mobile middle class became wealthier and the boundaries were blurred with the aristocracy. However, she is at pains to point out that both the middle class and the aristocracy, in and among themselves, expressed conflicting values. The middle class may have been industrial, but it also embraced an antithetical ethic that denigrated competition; the aristocracy combined elements of disinterestedness with aggressive competition. Depending on the values under discussion, relations between the middle class and aristocracy could conflict with, or accommodate each other. She has examined a huge range of texts across these three genres- her bibliography for these primary sources stretches to eight pages. The whole enterprise of proscription and prescription of morals and manners was steeped in paradox. The standards for fashionable behaviour were spelled out to facilitate social advancement, but at the same time, they kept changing so as to keep people out. The evangelical moralists exhorted people of sound moral character to appear as they really were, but at the same time they were to avoid offending others and be reserved and modest and above all, sincere- even if they weren’t really. However, she noted a change in the early 1840s, when etiquette books began to incorporate elements, albeit superficially at first, of principles of morality and ethics while continuing their emphasis on manners and decorum. This trend manifested itself in the rise of professionalism whereby aristocratic and middle-class ideals were merged into legally sanctioned professional behavioural codes and credentials, firmly ground in etiquette and ethics, in a range of fields- the church, law, medicine, government and armed services. It was an accommodation on the part of both the aristocracy and the middle class and both groups felt that they could embrace professional goals without feeling they had compromised their values. Written in 1994, this book travels in the wake of Davidoff and Hall’s Family Fortunes which was first published in 1987. Its argument is largely consistent with Davidoff and Hall, but it delves into the realm of ideals and expectations, rather than actual lives that figure so strongly in Davidoff and Hall’s book. The earlier book took the middle class, and particularly women, as its focus, but Morgan’s book looks at the accommodation between both the aristocracy and the middle class, both in expectation of behaviour in the home and in the professions more widely. This book interested me in relation to Judge Willis because I am examining his career from the 1820s to 1840s- precisely the time that these changes were occurring. Our perception of the early Victorian sensibility tends to be swamped by the depictions of behaviour and expectations so vividly drawn by the mid-Victorian novelists- our Dickens and Trollopes. The settler colonial condition, both in Upper Canada and New South Wales, added more tension to already brittle upward mobility. The Port Phillip newspapers carried in their columns the reports of fashions and observations about behaviour taken from metropolitan newspapers, and although these new societies brought together strangers into new constellations, you have the sense that, among those who aspired to colonial gentry at least, everyone was watching everyone else very closely. There was a mental template for how one ought to behave, and this book provides one way of investigating this ideal- no matter how imperfectly it was met. I’ve just returned from doing my democratic duty up at the local school. 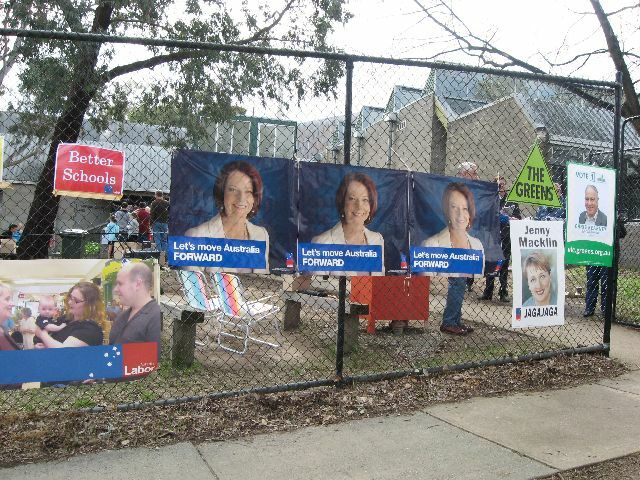 It’s election day here in Australia, and one that I feel rather pessimistic about. Elections are always held on a Saturday and voting is compulsory- something that I have absolutely no problem with. I think of the bravery of people in other parts of the world who carry around their ink-dipped fingers (how dangerous could that be in some situations!) and I am grateful that I can vote in a country that expects and requires me to do so as a citizen in a well-organized and fully-financed electoral system. My gratitude and trust in the system stands, no matter what the outcome tonight, tomorrow or maybe weeks down the track. So what about elections in Judge Willis’ time? Of course, the whole concept of a Federal Election in Melbourne had to wait until 30 March 1901 but the first colony-wide election for NSW was held in 1843. Until the passing of the 1842 New South Wales Act, the Legislative Council had been nominated by the governor, but the 1842 Act allowed for 36 members, twelve appointed and the rest elected. The relative lateness of elected representation reflects the penal origins of the colony: Upper Canada had been awarded representative government nearly fifty years early with the Constitutional Act of 1791. Port Phillip was still part of New South Wales at this stage. Six members in total would be elected from the Port Phillip district, five from the district as a whole, with one from Melbourne. There was not exactly a rush: the Council sat in Sydney, six hundred miles away, and few Port Phillip citizens were prepared to travel and stay in Sydney for council sessions. As a result, of the five district members who were elected, only two – Charles Ebden and Dr Thomson from Geelong- were from Port Phillip. The rest were Sydney-siders: Dr Charles Nicholson; the merchant Thomas Walker (who did have extensive holdings in Port Phillip and particularly in Heidelberg but was based in Sydney); and Rev John Dunmore Lang. Two other Sydney residents- Thomas Mitchell, the Surveyor General, and James Macarthur Jnr, the son of Hannibal Macarthur also stood, but Mitchell was not successful and Macarthur withdrew his nomination before election day. There had been talk earlier that Joseph Hawdon, the wealthy cattler overseer and builder of Banyule homestead in Heidelberg, would stand but this did not eventuate and he, too, was Sydney-based. Certainly the election did not have the immediacy of the Town Council elections which had been conducted some six months earlier. Edward Curr, who had previously been a member of the Van Diemens Land Legislative Council, accepted candidacy for the Melbourne seat. He was a prickly, forthright character who clashed strongly with Willis, along with many others in Port Phillip, it must be said. It was his strong Catholicism that prompted the equally prickly and forthright Presbyterian candidate Rev J.D. Lang to cast about for a contending candidate for the Melbourne seat, lest Curr the Catholic be elected unopposed. Lang and Kerr, the editor of Fawkner’s Port Phillip Patriot (with whom Lang was staying while campaigning in Port Phillip) decided to approach Henry Condell, the Mayor, asking him to stand. They promised to organize a petition of 200 Melbourne electors by 4.00 pm the next day and Lang offered to write all of Condell’s speeches for him. The election was conducted in four locations. 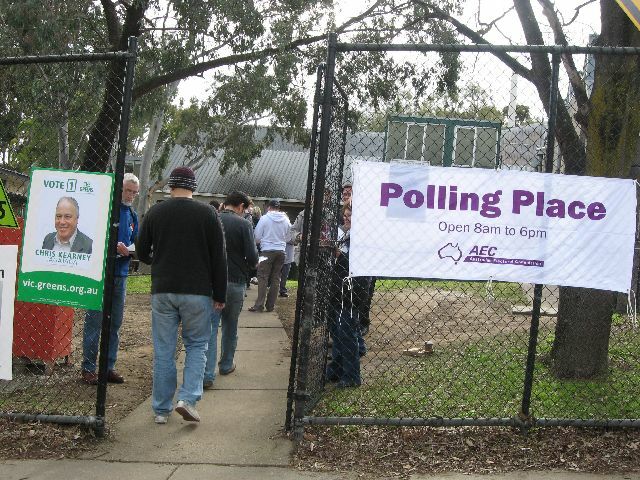 Voting for the district seats took place in Portland, Geelong and Melbourne, while the voting for the Melbourne seat took place in the Gipps ward of Melbourne. In many regards they were typical English-style elections: the votes themselves were announced (no secret voting here! ), there were placards and ribbons, and the alcohol flowed freely. At the close of the ceremony, Mr Ebden’s horses were taken from his carriage, which containing Mr Ebden, his brother Mr Alfred Ebden, Mr Curr and Mr Foster, was dragged through the town. The town band paraded the streets from an early hour in the morning til late in the afternoon, but little interest was manifested in the proceedings, the dismissal of the judge having evidently taken possession of the public mind. And here two of the anxieties that La Trobe dreaded coincided: the unruliness of the election, and the excitement over Willis’ dismissal. But that’s a post for another day (maybe). It’s hard to tell how many people were eligible to vote. The franchise was for males over 21 who owned freehold property worth 200 pound or rented a property worth 20 pounds per annum, a natural born (British) subject or naturalized. Those who had committed “treason, felony or infamous offence” could not vote unless they had been pardoned or undergone their sentence- an issue of controversy in regard to the applicability of English law in a former penal colony. As far as the ‘district’ elections were concerned, the Port Phillip Herald a few days later published full details of the results. The names of the voters were given, the booth they voted at, the time that they attended, and the candidates to whom they gave their votes – no privacy here! The final results were: Ebden 228, Walker 217, Nicholson 205, Thomson 1843, Lang 165 and Mitchell 157 . In Melbourne, Condell received 205 votes to Curr’s 174 but the names of the voters were not given. I’m not sure how many votes people had, given that many men owned multiple properties, and how the practice of ‘plumping’ (i.e. giving all your votes to one candidate) applied here. Either way- we’re not looking at a huge electorate. History is made up of a multitude of whispery but insistent voices from the past, each filled with its own imaginings and fond hopes, cynicism or despair, its own way of understanding an endlessly complex world, of explaining the inexplicable, of articulating an imperfect, subjective grasp on an historically determined existence. This conglomerate of contested, contingent meaning making that we call experience must be caught in a finer mesh, in the analysis of the webs of life as lived by individuals in relation to each other, as well as in the broader web of discourses that shaped and sought to define those lives. In analysis of the particular, and in the complexity of its relationship to the general, lies the recurring fascination of history. 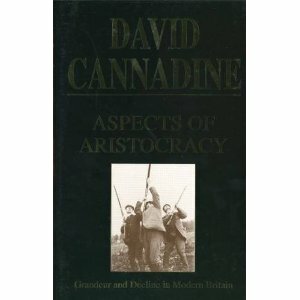 This book is a series of essays that Cannadine wrote during the process of writing his Decline and Fall of the British Aristocracy. Having not read that book, I can only assume that the essays reflect aspects of the larger work, but in themselves they are self-contained and immensely readable. Cannadine argues that, despite the assertion by the aristocracy itself of its unchanging nature and antiquity, the aristocracy was in fact transformed in the late eighteenth century. Because of a largely unexplained demographic crisis among English noble families at that time, estates were integrated and consolidated into supra-national empires, spanning England, Wales, Ireland and Scotland, thus leading to a new apex of super-rich grandees. These were supplemented by self-made merchants, nabobs and industrialists who bought their way in, then established themselves as bona-fide landlords. Public servants, too, fitted themselves out with the accoutrements of landed aristocracy. That bible of gentility, Burkes Peerage, published in 1826 documented this new/old phenomenon, a hold that they maintained by making, in reality, very few concessions. He picks up on the debate between David Spring and F.M.L. Thompson over aristocratic indebtedness, and especially the received Spring-ian view that the Regency families were spendthrifts, while their mid-Victorian sons moved towards sobriety and solvency in the mid 1800s. Cannadine finds that debt seemed to be an ongoing reality, though its arena changed- e.g. development of money markets with local attorneys and solicitors, banks, insurance companies etc. There was borrowing to maintain and enhance family prestige e.g. to provide settlements for members of the family, to build houses and buy land, but there was also borrowing for profit e.g. improvement of land and investment in non-agricultural enterprises- especially coal mining and transport. He concludes, therefore, that the distinction between early and mid-Victorian debt was overdrawn, and that if there is a pivotal period, rather than the 1840s it is 1870-1880 when declining rentals and agricultural prices led to greater indebtedness. When death duties were introduced in 1894, they were 10% of the property assessed higher than 1 million pounds- ruinous if a property was heavily encumbered. The rest of the book deals with different dynastic and individual portraits that illustrate his central thesis. Lord Curzon is depicted as a “ceremonial impressario” whose stage-craft embodied and shaped the image and consciousness of empire. Winston Churchill he sees as inherently unrespectable in both his relatives and choice of friends: he was politically suspect and unpredictable, and essentially paternalistic and anti-democratic. The Cozens-Hardy family of Norfolk exemplify the ‘new’ upper class, spreading across trade, the law, local paternalist government and local/antiquarian history. Nicholson/Sackville-West are addressed less as sexual and literary oddities than as exemplars of the snobbish, anachronistic, sheltered and nostalgic twentieth-century upper class. To prove, eventually, that he has a political purpose, Cannadine closes with a condemnation of country-house worship that embalms what their owners themselves were happy to demolish, and transforms country houses into shrines to private galleries, a risible moral superiority and an unconscionable claim on public money.